Maimi recouperates after yesterday’s long day of filming with her beloved pet dogs in her July 31st update “Real time (^_-)“. Full translation below. Cologne and Aroma gathered around my feet…Σ(￣□￣)! 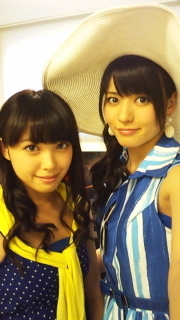 Posted on July 31, 2013, in Blog, Translations and tagged Yajima Maimi. Bookmark the permalink. Leave a comment.